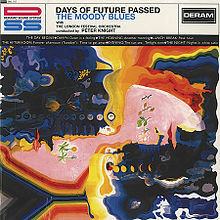 The Moody Blues burst upon the American music scene the year the Watergate burglary took place and I was a sophomore in high school. Their treasure trove of six concept albums, which had been previously released over a 5-year period in England, were a gift to teens who were looking for literate music with meaning. A productive afternoon was spending an afternoon at a friend’s house playing the Moodies’ albums on the Hi-Fi while reading and discussing the “heavy” meanings of lyrics printed on the back of their album covers. The original album cover for Days of Future Passed. The album was in part a showcase for the record label’s new Deramic Surround System (advertised in the upper-left corner), which enabled an unusual depth to stereo sound. The first half of the show concentrated on songs from their many other albums, leaving me disappointed that they did not play any of my favorites from their Threshold of a Dream album except as an encore. Another downside was that much of the instrumentation drown out the words, which is ghastly for songs where the words matter as much – if not more, – than the music. The projected psychedelic symbols were a blast from the past at first, but became tiresome as they went on and on. But the concert transformed into a fantastical evening in the second half when the band played their Days of Future Passed album in its entirety. Everything was perfect, the distracting psychedelic symbols shifted to actor Jeremy Irons’ face and narration, with film vignettes complimenting the songs. The lyrics were clear and one did not even mind that the famous orchestration for the songs was on tape rather than on stage. Hayward’s singing on both “Tuesday Afternoon” and “Knights in White Satin” soared, bringing the audience to its feet both times and making me feel 15 years’ old again. As the very satisfied audience was leaving, one concertgoer told me this was his 26th Moodies’ concert and that he could not wait until they had their 50th-anniversary tour for On a Threshold of a Dream (not so far away – that album was originally released in 1969). I share this sentiment, but hope the Moodies will opt for a 49th-anniversary tour for the Threshold album so I won’t have to wait two more years to repeat this splendid experience.